An essential investigation of Marksmen in the Early Game, Mid-Game, Late-Game, and Flank Theory interlude. How to act and position yourself as ADc in team fights. The Cornucopia of Extremely Helpful Guides hath returned. Houdini’s back again, baby, and this time we’re going to get down to business. Today, the Marksman. It’s widely thought that mechanical skill and actions per minute(APM) are among the most consequential qualities when learning to play the marksman. This, however, is completely untrue. While those may be prerequisite aspects of the role in question, the ones you need to really watch out for are quick-decision making and a consistent appraisal system. Before we bound onto the basics, let’s break these notions down. One might think this would be important for any role, and it is, however, it’s ten-fold important for the Marksman. This is due to the razor-edge that the Marksman must always balance upon. Due to the inherent roles in LoL, the Marksman often if not always focus on damage per second(DPS), and this is true for builds as well. What does this mean? The marksman will always be working with the lowest health values, thus, they will be the nearest to death at any given moment. A single mechanical error can cause issues, of course, but often such fatal mechanical errors only occur due to panic, anxiety, frustration, or even a combination of these and more. There’s a reason the fight-or-flight response is a reaction to a threat to survival. As aforementioned, the Marksman will be the role most commonly in these situations, second to Mid-Lane. This means that a calm, collected mindset and ability to decide quickly and decisively will always be paramount to the Marksman as long as the role exists. What does this mean in micro-terms? Keep your flash trigger-finger as itchy as humanly possible! An ADC in the long run must be cognizant of the advantages each action provides. Something as simple as farming a minion wave might provide a gold reward, but will mean something entirely different if one’s jungler is dead. Each and every action an ADC takes early game is centered around gold, as that provides a gold-paved road to the late-game. Just as the marksman will always be working with the lowest health values, they will also often work with the highest consistent damage outputs. An ADC that cannot accurately identify leads will not stumble upon the correct answer by following empty habits, like a support might while haphazardly warding, or a tank might by simply soaking damage. There’s a reason Lee Sin says “Master yourself, master the enemy” in that order. 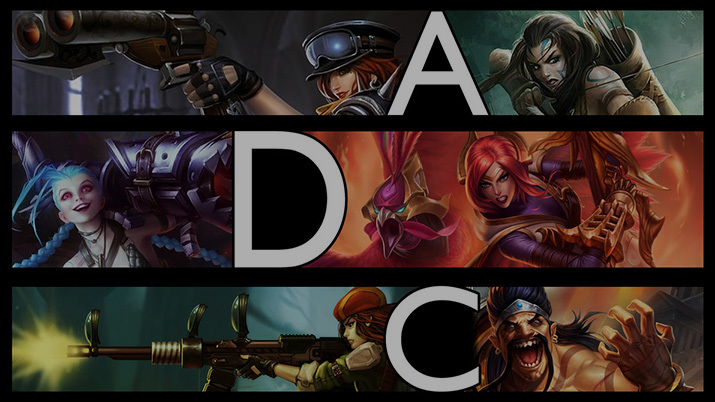 First you must comprehend what is best for your future in-game, as late-game tends to be ADC-centric, directly or indirectly. The Marksman has a few vital advantages over other characters and playstyles. Intrinsically, Marksman are ranged, which allows damage to be dealt while being relatively unharmed in a perfect scenario. As such, you see Marksman build mainly damage items. However, many bruisers, assassins, supports, mages, and even other ADC’s have a stop-gap measure to ranged harass; dashes. The amount of dashes incorporated into the game has changed ADC expectations, and now, more calculations are needed to utilize that ranged advantage. To know the innate advantages of Marksman allows you to make use of those strengths. Every decision made should be take into account the value of a potential outcome and thus repercussions of such. An obvious example; An ADC wishes to attack an engage tank like Sejuani or perhaps Gragas. A single auto-attack landed has a reward of dealing minor damage to the victim’s health. The risk belongs moreso to the ADC, and directly regarding the engage potential apparent. AN ADC MUST ALWAYS BE AWARE OF ONE’S ALLIES. I CAN’T UNDERPLAY THIS. Location of allies is one of the most accurate information capable of consuming at any given time. Barring Nocturne, Graves, and a few others. Even then, you, not just Lee Sin, have senses capable of determining allied locations. Namely, predictive and deductive reasoning. The early game should be something of an incubation period for an ADC. The game’s economy has been broken, and players have decided to create a role that does not have immanent gold claims simply to benefit the Marksman. Remember, these so called “supports” are volatile and may do anything, but try to react in kind. Namely, get that gold. You’d let the world burn as long as you’ve got those shiny pieces. In a general sense, there’s a few hard and fast rules for the laning Marksman. 1. The level two power-spike, not just a meme. Many streamers, ex-pros, pros, and even regular players have participated in this cultural experiment. Sadly, the “Imaqtpie” we all know and love has pulled the ultimate deception. Disparaging a massive advantage. I believe his underlying strategy is to convince his enemies the level two power-strike is weak, only to reap the full benefits personally. Zoning, pushing even harder, roaming, or warding are among the best options available. Let’s take a moment to bring in the current Worlds lessons. Often times, the blue side might push up and then free the support to ward the enemy Gromp+Blue Buff early on. With the information this gives, it’s clear to see the advantages of such a play. All fabricated from simple pushing. Don’t condemn those random autos from supports; they might be for a very important purpose. In the same fashion, if you will be under threat in the near future, do not attempt to push. This will simply leave you vulnerable. Respect your enemy. Staying in lane auto attacking minions as a Level One Twitch can mean death against a Level Two Lucian and Leona combo regardless of how or when you will reach Level Two. If that Leona has ignite, and is willing to blow summoners when you are inevitably forced to, consider yourself a dead rat. Perhaps that grueling image will shock you into smart play. Don’t tell anyone I didn’t try. 2. Missed CS isn’t the end of the game, but a death can mean the end of the lane. To put it in perspective, the first wave has a gold value of 118.33 gold. The first kill has a value of 400 gold. 3. Play with your support, not against. If you’ve trouble cooperating, and are considerably pessimistic, try to inform your support that you will not fight under any circumstances, in any way possible. But be brief. A few pings or a single sentence can get this point across, any more and you’re risking jumping into a vat of salt. The only way either of you is getting out of the lane alive is if you cooperate, however little that may be. Take that to heart. Of course, don’t follow blindly and don’t order blindly. It takes two to tango, and you don’t know if the enemy lane has the skills to match. It could be Michael Jackson or a rock that’s blind, deaf, and dumb. 4. Stay aware and count summoner spells. 5. If the enemy has a lead, respect them. A lead can mean many things, but generally translates into priority around objectives and warding. This means that it’s more likely to be ganked, dove, or lose a straight up 2v2. It’s better to give up the turret and perhaps push for different objectives then stay and give over even more gold. If you’ve got backup in the form of a teleport, jungler, or mid roam remember that while you may have a temporary advantage, the enemy reinforcements won’t be too far behind. The fastest way for your entire team to lose a lead is to attempt to bail you out of a bad situation and fail. The mid-game is a special time period where the traditional laning phase ends and macro-positioning truly begins. Picks, skirmishes, team-fighting, and general jockeying for position occurs at a higher rate due to objective capabilities opening up. A simple rule every LoL player knows: you cannot push without minion pressure. Thus, minions become the avenue to success. An ADC values the minion wave above all else, and understands the true value of minion management that is often overlooked. A method to create pressure. A simple rule; if you wish to group with your team; push your lane first and then proceed to team up. If you wish to freeze your lane be prepared for your allies to take extra pressure and/or ganks. Informing your allies of missing enemies is a must in this situation. Often times if one can freeze it will merely displace the enemy, key word: displace. The adversary in question will almost definitely travel somewhere else. If you’re able to push as efficiently as possible when need be, you can quickly alleviate pressure when the team is being harassed on another side of the map. Faster wave pushing means that you’re time is freed up, treat your time as a resource. 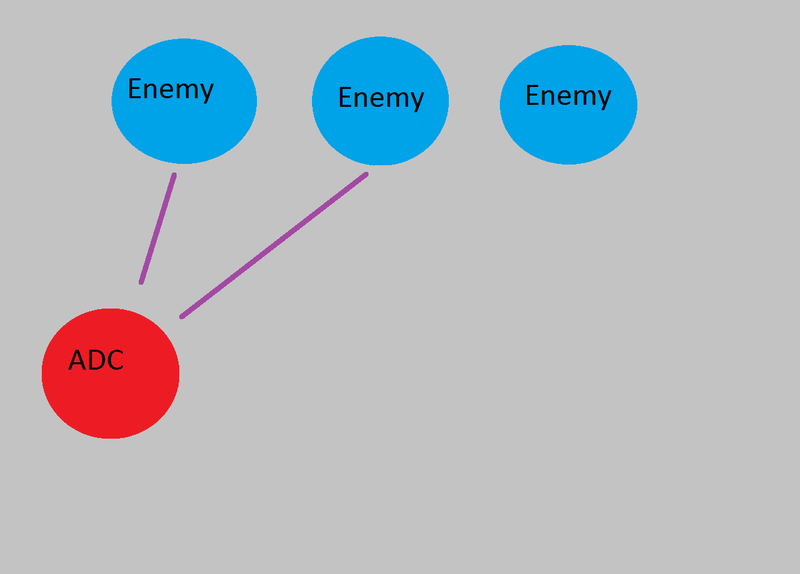 If you’re free to do something else, you can match the location of the enemy ADC or perhaps gain gold or objective advantages in other locations. Remember, if you happen to lose your turret, never overextend. This is doubly true if in a bad match-up. Respond to enemy and allied roams accordingly. 1. You need to know your farm patterns, fast and slow. Different champions have different farm speeds. Some need to build Hurricane or Statikk Shiv, although besides “The Sneaky”, Statikk Shiv item is fairly uncommon, to complement those patterns. Hurricane has seen some increased usage on champions such as Caitlyn and Twitch. Be able to farm without using mana, while conserving abilities, at max distance from the creeps, and be able to maximize ability damage. In some cases abilities can be used to assure that no farm is missed, due to being able to quickly cast those farming tools between auto-attacks. 2. Understand what lanes can be frozen, and how to do so. Some lanes simply can’t be frozen, this has to do with minion reinforcement timing amount of minions present, and proximity to turret. In short, if your reinforcements will arrive sooner then the enemies’ that adds a push factor. To match that, there must be more enemy minions than one’s own. However, too many enemy minions and the enemy wave will push towards oneself. 3. Know when to push, and how to do so safely. In most cases, the ADC cannot afford being caught and collapsed upon while pushing. Udyrs and Shyvannas may be capable of this, but it is often not worth it. Perhaps in the case of Vayne, but even then, split-pushing is a risky endeavor for the average ADC. Leave that to the rats. Oh wait, this isn’t Dota. The marksman in the team-fight needs to be a survivor. Above all else, force the enemy to overextend to kill you. The lower your attack range, the more risk you will have to partake in to participate in the fight. . “Vaynespotting” can occur to any average greedy ADC. If you limit yourself to attacking the closet target it may seem like you are limiting yourself, but you are also limiting the enemy’s avenues of attack upon you. This is where threat analysis is extremely vital. Combine that with positioning, and you’ve encroached upon the quick-decision making and consistent appraisal system utterly vital to the ADC mindset. In theory, team-fighting might be easy, but it’s all about execution. Hopefully not yours. With a little help from even the most basic diagrams, the importance of flanks can be exemplified. Inherently, an ADC might know this information, but maximizing it’s usage is difficult. 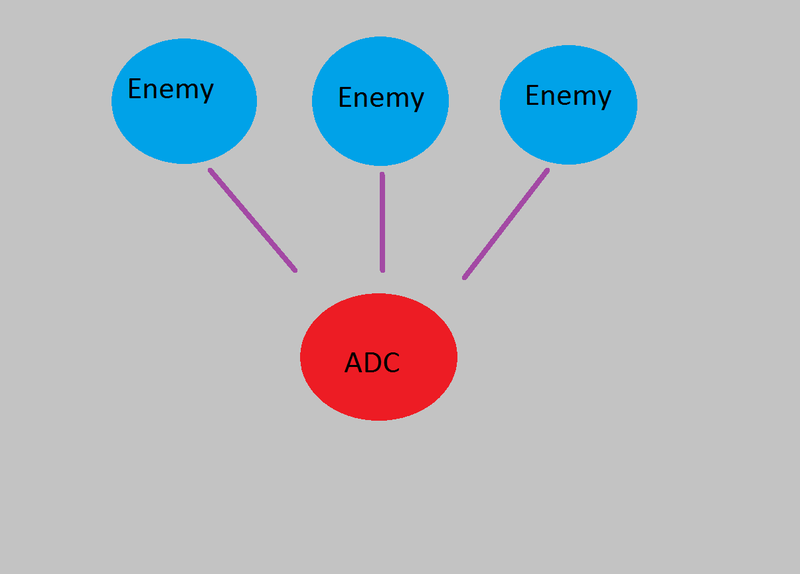 As you can see, each of the three foes has access to the ADC. Have you learned the lesson yet? Naturally, you have, my readers are intelligent people. After all, it’s not every day you get a simple, easy to understand guide directly from a master player. While I may have construed this situation as simple, a similar one in-game is not always as such. One must account for attack ranges, abilities, gap-closers, and a plethora of other similarly important items. However, the logistics still stay the same. We’re done here. The lategame is almost solely consisting of battles over objectives, whether that be your own base, Baron, Dragons, or Elder Dragon. Teamfighting happens frequently, as everyone has their eyes on the prize, rather then measly things like gold generating activities. It is your duty to be near the team fora teamfight, but not your duty to engage. Perhaps you’re playing a heavy utility ADC like Ashe or Sivir, you still should not engage. You may fire the first shot, but you are no front-line tank. The all-praised positioning has to do with decisions before the teamfight even breaks out. Decisions such as; how far away from my tanks am I? While you may not be front-line, if you’re too far back and can’t deal any damage at all consider your contribution moot. You’d might as well go push another lane to create pressure. This balance of location is a tough one to keep in equilibrium, but I believe in you. Worst case scenario, you learn what not to do. In the late-game, it is better to be safe than sorry. Take as little risk as possible. Keep your feet on the ground, and your eyes on the ball screen. To play the Marksman is to assure one’s footing in both quick-decision making and keep one’s mind sharp with solid assessments. A single mistake can mean death, but not just for you. Farm as many minions as possible. Buy as many items as possible. But most importantly, win as much as possible. Now get out there and get those Pentakills soldier, they don’t grow on trees. ADc is the most interesting role in the League, imho! That feeling when in the late game you can destroy all enemy team just by yourself. Aw yiss. This guide is superb, i’ve already read some guides from Houdini, and i must say that this guy is freaking awesome. Love all his works here! It is in reality a great and useful piece of information. I am happy that you simply shared this useful information with us. Please stay us informed like this. Thanks for sharing.